Celebrating the 200th anniversary of Rio's Museum of Natural History (Museu Nacional), the samba school from Zona Norte will be the fifth to star on the Sambódromo on Monday, February 12th. RIO DE JANEIRO, BRAZIL – On Monday, February 12th, Imperatriz Leopoldinense will be the samba school to follow Salgueiro on the 2018 Grupo Especial’s parade. Expected to enter the Avenida at 1:35 AM (on Tuesday early morning), Imperatriz will bring to the judging panel a samba enredo on the history of Rio’s Museu Nacional, the former residence of Brazil’s Imperial Family. Only school to have obtained the maximum punctuation in all categories, in three different championships, Imperatriz will be the fifth to parade on Monday, February 12th, photo by Tata Barreto/Riotur. Born in 1959, in the neighborhood of Ramos, Rio’s Zona Norte, Imperatriz is known for having always presented themes of great historical relevance. 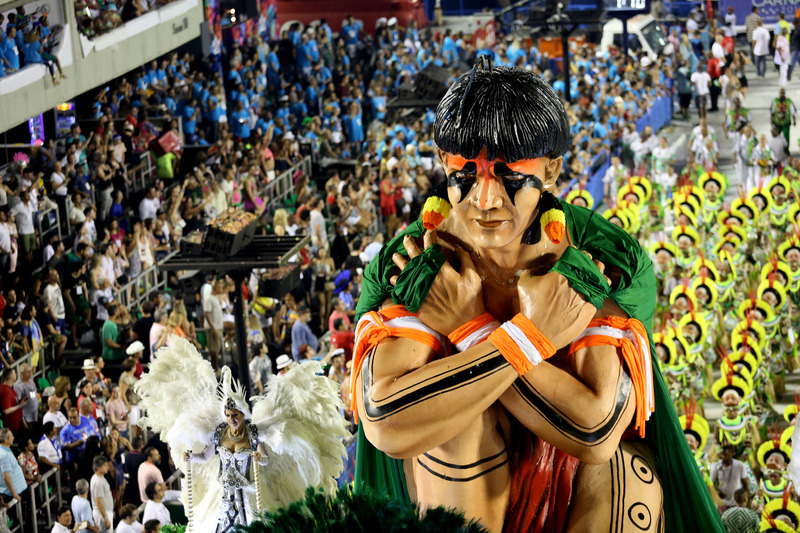 Thus, it was the fist samba school to found a Cultural Department, responsible for assisting with the samba enredo’s elaboration. Imperatriz’ first title was conquered in 1961, two years after the school’s debut on the Avenida, with a samba enredo on the Brazilian Academy of Letters. 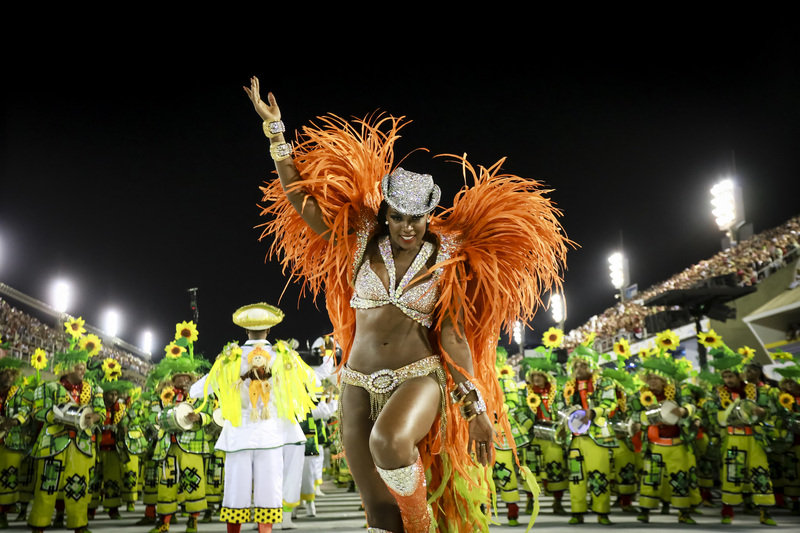 Maintaining a position in Grupo Especial since 1990, Imperatriz has already been first placed nine times in the samba school’s championships – six of them in the First League. Among Imperatriz Leopoldinense’s memorable samba enredos, “Liberdade, Liberdade! Abra As Asas Sobre Nós!” is, undoubtedly, the most iconic, played in the present day in diverse “rodas de samba” and even in Brazilian soap operas. Released in the parade of 1989, “Liberdade, Liberdade!” is a true anthem for the end of slavery in Brazil. In 1972, the green-and-white samba school became famous all over the country for being portrayed on the television: it was picked as the main setting of Rede Globo’s soap-opera “Bandeira 2”. On top of everything, Imperatriz is proud to be the only school to have already obtained the maximum punctuation in all the categories in three different Carnivals: 1980, 1989 and 2001. This year, Imperatriz will tell a little from Brazil’s history by portraying the life inside the former residence of Brazil’s Imperial Family, the current Museu Nacional, photo by Cézar Loureiro/Riotur. This year Imperatriz hopes to have all eyes on them with “A Noite Real no Museu Nacional”, samba enredo dedicated to the 200th anniversary of Museu Nacional, the current Museum of Natural History in Rio. Written by Jorge Arthur, Maninho do Ponto, Julinho Maestro, Marcio Pessi and Piu das Casinhas, the lyrics aim to tell the audience a little from Brazil’s history by portraying the life inside the former residence of Brazil’s Imperial Family. Initially located in Campo de Santanna, in Rio’s Centro, Museu Nacional was created by Dom João VI (former Portuguese King) in June 1818, and is the oldest Brazilian scientific institution. Originally called Museu Real (Royal Museum), Museu Nacional, located in São Cristóvão, Zona Norte, is currently part of Universidade Federal do Rio de Janeiro (Rio’s Federal University). “Museu Nacional cries out for help. It is sad to notice the conditions in which the museum is found. We are talking about a two hundred year-old institution, which is part of Brazil’s history. It is necessary to shed light on this situation, and take better care of this heritage,” affirms Rodrigues.